Curating an art exhibit is exciting and some days, stressful. Merging many artists into one anything is a feat. You’ve heard of the difficult tortured artist? Well think of 50 to 100 artists, each one with their personal needs, schedules, personalities. Sometimes the best artists have the biggest diva moments. Yes, even some of your most beloved, down-to-earth, hommie, street artists, have their ego-melt-downs. Meanwhile, as the curator, I need to maintain a calm poker face which evokes “Everything is fine. I know what I am doing. We are perfectly on schedule. Don’t worry, I got this”, to everyone involved. 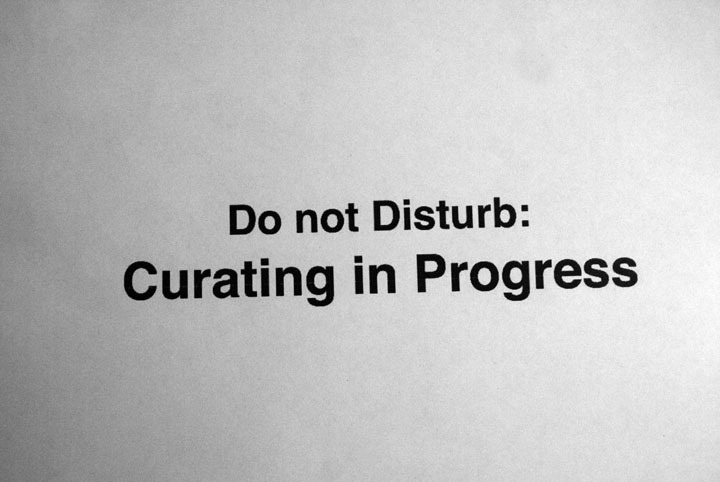 The curator must stay calm. I’ve even remained calm when featured artists have shown up half-hour before an opening with wet paintings or hours late for their presentations. Stressed gallery staff/owners have said to me, “Call your boy. Where is the artist? What should we do/say to the guests? There’s no art on the walls!” By then, there is nothing that can be done but reorganize the schedule, calm the guests and gallery people with optimistic chatter and more calmness. The later it gets before the artist arrives, the harder the gallery people look at me, like I am a poor judge of artists. At a certain point, all my meditation and Zen training informs me that once an idea has been articulated—it has its own life in the universe. It is no longer mine. Like any life-form, one can only tend and facilitate an idea as best one can—and without any known formula, rhyme or reason, an idea (exhibit) is going to be what it is going to be. Of course, one could try and dictate what every little detail will be and when it is not how one imagined, have a nervous break-down—but in Zen, you let go of control. Learning to let go, has amazing rewards and most times matters turn out better than you had thought. Note that there is a difference between nurture and control. A few months ago, I attended a lecture curated by Bill Kelly, Jr. who is the 2012-13 Curator in Residence at 18th Street Art Complex in Santa Monica. I was so lucky to have a moment alone with him before the lecture room filled up. I asked him if he ever felt like the referee between exhibit spaces and the artists. He quickly said, “No”, adding that I probably encourage that familiarity with both entities. This has made me think carefully about my authority rating as a curator. In the end, I am okay with relinquishing some of my direction-rights in anything I do for the chance of learning new ways and being surprised by them.